Anyone Can Shop. Everyone Can Join. Imagine walking into a store where you are greeted with a smile, where the staff members are waiting to help you find what you need. Imagine the shelves are lined with all of your favorite products, many of which are grown or produced by people you know. Imagine how it would feel to be able to trust that the products in the store were carefully selected because dedicated and knowledgeable buyers are guided by a food policy and store mission committed to providing you with the highest quality nutritious whole foods. Imagine that you have a voice and a vote – that you can elect who sets the policies and direction of the store. Imagine that as this business grows and profits, you would get a share of the profit. Not many people can say that they own the the store where they shop, but at the Co-op you can. You own it. We own it together. 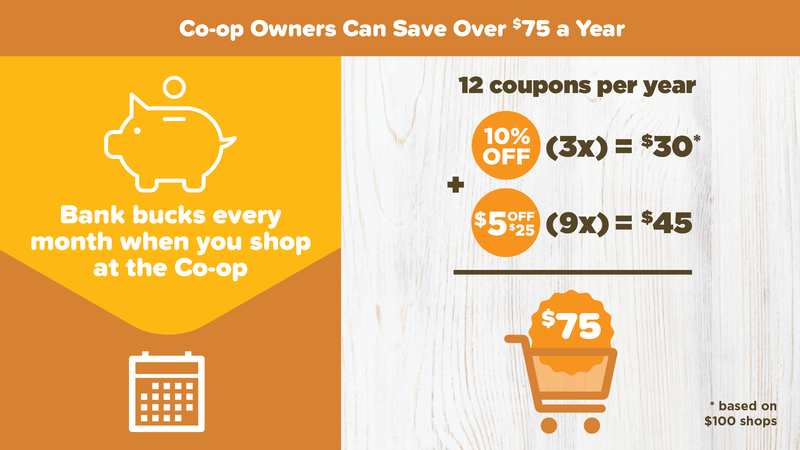 A one-time refundable equity investment of $100 gets you a lifetime of owner benefits at the Ashland Food Co-op. And here’s the best part—you don’t have to pay for it all at once. Become an owner by making an initial payment of as little as $10. You can complete an owner application at the Information Desk. Owner Coupons: Owners can save 10% three times per year and receive $45 in coupons throughout the year. Bi-Monthly Newsletters: The Co-op's electronic newsletter is emailed to you every two months and will keep you up to date on all things Co-op including handy health tips, recipe ideas, and farm and food producer profiles. Cooking Classes: From Moroccan cuisine to bread baking, enhance your culinary skills at one of our upcoming cooking classes. Owners receive $5 off each class. Gift Card Discounts: Owners receive a discount of $3 when purchasing a $100 AFC gift card with cash or check. Patronage Dividend: Owners share the profit. Patronage dividends are distributed annually in proportion to purchases. Participation: Owners are encouraged to participate democratically in the governance of the Co-op by running for a board position and holding office, voting in elections, and joining committees. The Ashland Food Cooperative is a member-owned and member-governed cooperative corporation with the Board of Directors acting as the decision-making center of the business. The board provides overall direction for the Co-op on behalf of the ownership, ensures sound management to achieve the goals of the Co-op, and keeps the ownership informed about the status of the business. Board members are elected by the ownership for a three-year term. We encourage all members to consider service at this level. Board members must be Co-op owners in good standing. Knowledge of natural foods is desirable. Prior experience, education, or skills could include: work on a volunteer board; financial, business, or legal background management, supervisory, or organizational skills; negotiation, facilitation, and conflict resolution skills; collective/cooperative experience.